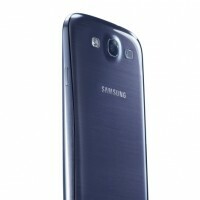 Last week Samsung has held a huge press event in London where they showed their upcoming Samsung Galaxy S3 for the first time in public. Therefore the launch of their new flagship smartphone has to be near. In the meantime we present to you in this article all the important information about the new super phone. 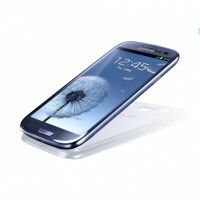 With its dimensions of 136.6 x 70.6 x 8.55 millimeters Samsungs Galaxy S3 is everything but small. Compared to its predecessor which measured 124 x 66 x 9 millimeters the Koreans added quite something to the size. Nevertheless there is a good reason for this things shere size: Samsung decided to equip the S3 with a 4.8 inch Super AMOLED touchscreen that features 1280 x 720 HD Ready resolution. In other words this mean a pixel density above 300 ppi and therefore you get excellent readability even if there are very small letters. Although Samsung isn't the first company to introduce a display with high pixel density, there are for example HTC and Apple who can reach the same numbers, at least they managed to reach the same level as the competition. It seems that in another league, that's where Samsungs new SoC plays. The new Exynos 4412 is a quad core part that clocks at 1.4 Gigahertz. Samsung also improved their Mali 400 graphics unit which clocks at 400 Megahertz meanwhile. These days it looks like smartphones don't need more than 1 Gigabyte memory. 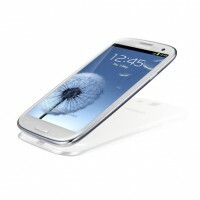 Like with the S2 Samsungs crafted a case for the S3 which seem cheap at a first glance. At least it looks like the company had to save money somewhere. Using thin plastic and a chassis which is not that stiff also brings adavantages. For example: if you take an iPhone and drop it from 50 centimeters height on one of its edges then the glass will definitely break. With the Samsung you might be luckier in such a situation, but we would also prefer to have a device which comes with a very nice design and build quality. Something else that is remarkable is the fact that Samsung chose to eliminate black from their color palette. 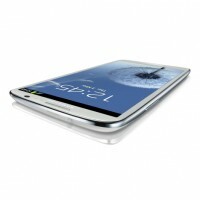 The S3 should be available in a very dark blue as well as in white. 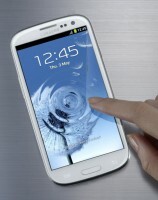 We're really curious what the Samsung S3 will look like when we have it in our hands. Reading the list of connectivity features is quite impressive. There is USB, DLNA, WiFi b/g/n, Bluetooth 4.0, NFC, WiFi-Direct and HSPA. But one feature is missing: LTE (Long Term Evolution). It's hard to understand why the Koreans didn't equip this device with LTE. These days this technology is being pushed in a lot of countries and therefore such a feature would have made Samsungs new device even more future proof. Probalby they will introduce a version of the S3 with LTE. It isn't a surprise that Samsungs chose to put Android 4 Ice Cream Sandwich on the S3. To be exact they it is Android Version 4.0.4 that actually installed on their devices these days. 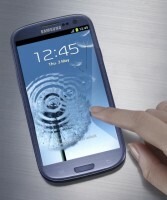 And of course Samsung adopted its TouchWiz interface for Android 4. On the software side there aren't a lot of new apps but there are quite a few neat improvements. One itneresting thing is for example "Smart Stay". This feature uses facial recognition to track a users eyes and dimm the brightness of the display when a user isn't looking at it. Furthermore the S3 should be able to recognize faces when you take a group foto. It does this on the basis of the contacts stored on the device. Another improvement that concerns the camera is the new burst mode. If allows you to take a lot of pictures in very short time and after that the smartphone suggestes which one is the best to be stored. Someting that needs to be on the S3 is a voice recognition software. In this case it is called S-Voice. A big plus point with this version of S-Voice is for example that it does work with other languages than english too. 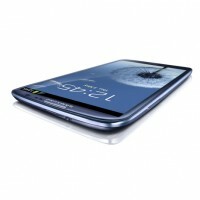 Compared to the S2, the S3 is quite a big step in the evolution of Samsungs Galaxy serires. The fact that there is no LTE support is a pity but at least there is hope that the Koreans will implement this in a future revision of the device. At the moment it seems like the Exynos 4412 SoC really is one of the fastest around. It seems a good idea to power it with a 2100 mAh battery pack. How long the battery will last that's what we will see when we hold this thing in our hands for a review. Another thing engadget.com has been writing about is that Samsung seems to work together with Dropbox to offer customers 50 Gigabyte of free cloud storage. 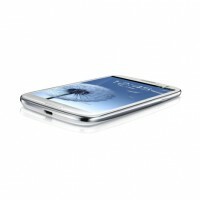 Once Samsungs Galaxy S3 hits the market, which should be on the 29th of may the "super smartphone" will cost about 599 Euros (est. CHF 699.-). This really isn't cheap, but still for what you get it's ok.